Abstract. Models of landscape evolution by river erosion are often either transport-limited (sediment is always available but may or may not be transportable) or detachment-limited (sediment must be detached from the bed but is then always transportable). While several models incorporate elements of, or transition between, transport-limited and detachment-limited behavior, most require that either sediment or bedrock, but not both, are eroded at any given time. 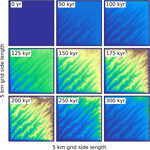 Modeling landscape evolution over large spatial and temporal scales requires a model that can (1) transition freely between transport-limited and detachment-limited behavior, (2) simultaneously treat sediment transport and bedrock erosion, and (3) run in 2-D over large grids and be coupled with other surface process models. We present SPACE (stream power with alluvium conservation and entrainment) 1.0, a new model for simultaneous evolution of an alluvium layer and a bedrock bed based on conservation of sediment mass both on the bed and in the water column. The model treats sediment transport and bedrock erosion simultaneously, embracing the reality that many rivers (even those commonly defined as bedrock rivers) flow over a partially alluviated bed. SPACE improves on previous models of bedrock–alluvial rivers by explicitly calculating sediment erosion and deposition rather than relying on a flux-divergence (Exner) approach. The SPACE model is a component of the Landlab modeling toolkit, a Python-language library used to create models of Earth surface processes. Landlab allows efficient coupling between the SPACE model and components simulating basin hydrology, hillslope evolution, weathering, lithospheric flexure, and other surface processes. Here, we first derive the governing equations of the SPACE model from existing sediment transport and bedrock erosion formulations and explore the behavior of local analytical solutions for sediment flux and alluvium thickness. We derive steady-state analytical solutions for channel slope, alluvium thickness, and sediment flux, and show that SPACE matches predicted behavior in detachment-limited, transport-limited, and mixed conditions. 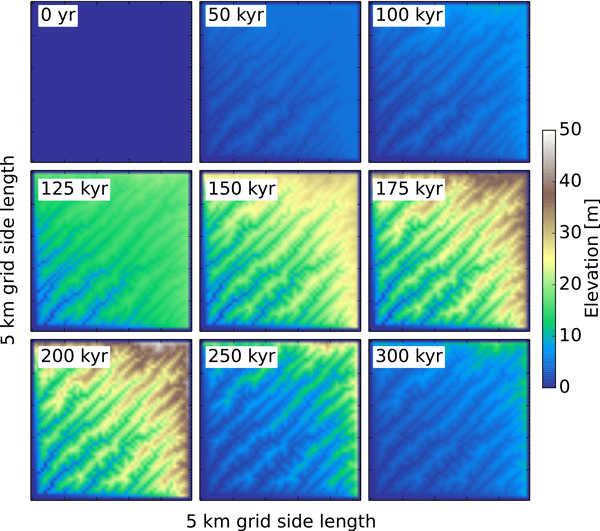 We provide an example of landscape evolution modeling in which SPACE is coupled with hillslope diffusion, and demonstrate that SPACE provides an effective framework for simultaneously modeling 2-D sediment transport and bedrock erosion. How to cite: Shobe, C. M., Tucker, G. E., and Barnhart, K. R.: The SPACE 1.0 model: a Landlab component for 2-D calculation of sediment transport, bedrock erosion, and landscape evolution, Geosci. Model Dev., 10, 4577-4604, https://doi.org/10.5194/gmd-10-4577-2017, 2017.